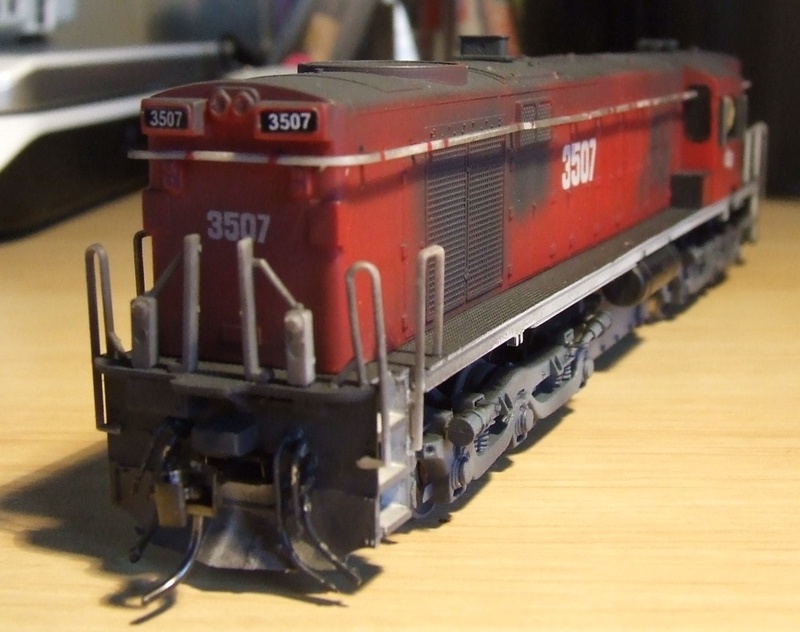 As mentioned in the last post I would do a solo post on the 35 class showing the modifications I had made. I found a photo of 3507 in the Alco DL531 book, this was my motivation. 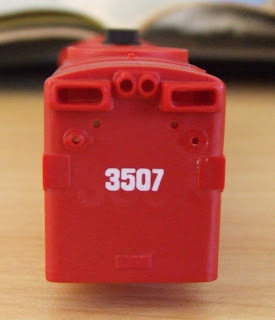 The AR Kits model is a generic version, or perhaps an as delivered version of the 45 class, so there were a few changes to be made. The original 35 (45) class straight from the box. 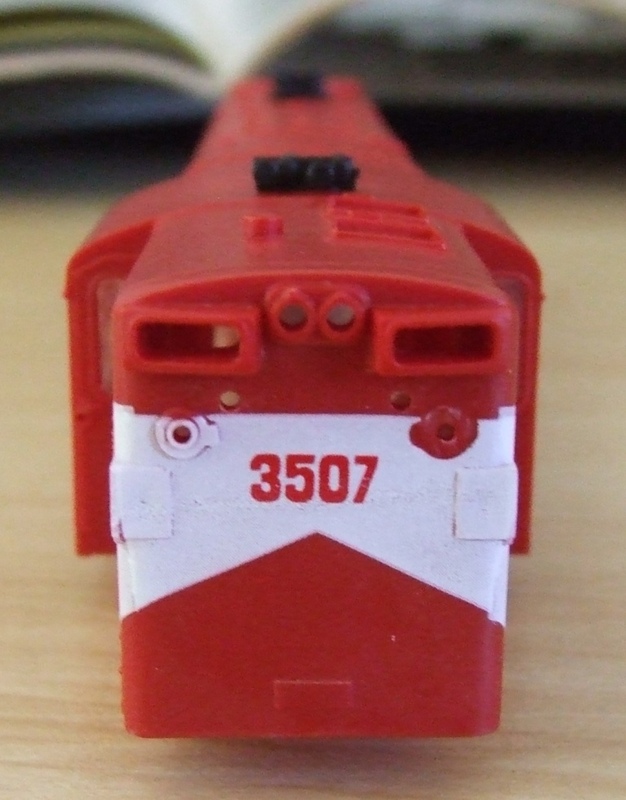 After disassembling the model and close study of the picture, it was noticed that it had twin marker lights. This was easily achieved by removing the moulding of the single light box (right) with a sharp hobby knife and attaching the supplied twin marker light and touching up with paint. The same was done to the front. Unfortunately I didn't take as many photos of the process as I thought I had. I also glued in the number board lights and headlights at this time. Another problem I found with the model is it doesn't have directional lighting. This was easily fixed by removing the old bulbs and adding a led light fitting. Another problem for me was the amount of light coming through the shell/body. This was an easy fix by simply painting the interior of the shell with black paint. 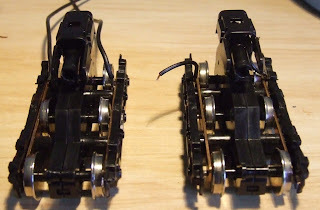 The amount of clearance between the side frames and wheels was another mod I wanted to make. This was found in the AMRM article on how to improve the 45 class. A very time consuming but easy and noticeable improvement. 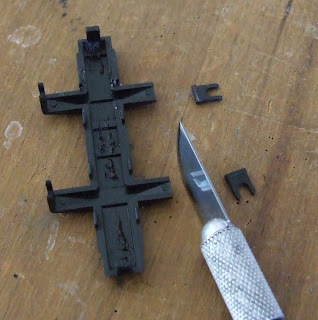 Just disassemble the bogie's and remove the area shown above. This amendment requires you to also move the wires soldered to the pickups, because if you don't the wheels don't move freely. The bogie on the left is the result and the one on the right the original. I think it looks much better and gets the brake shoes a lot closer to the wheels. The end result. Brass hoses were added to the pilots along with Kadee 25 couplers. With the cab I removed the piece of plastic and two centre window glass to more represent sliding glass windows. They were also touched up with black paint around the edges and the windows tinted with a nikko pen from the inside. 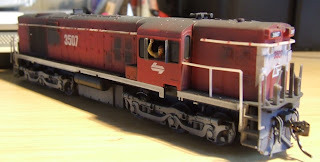 Crew were also added for realism. Before putting on the hand rails around the roof I touched them up red paint where they are fixed to the body. You may also notice the QR logo on the hood. This is clearly show in the photo from the book. The view from the long end. They weren't the hardest or most technical mods ever done but they were very effective for creating a more representative model.